Charlie Silvera is a gentleman for any era. 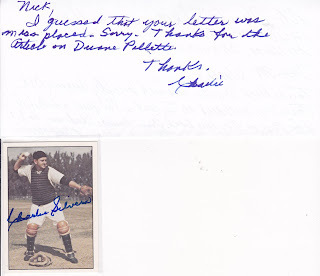 Last week, after 18 months, I received this nice note and signed baseball card from the former New York Yankees catcher apologizing for the delay in responding to my letter. 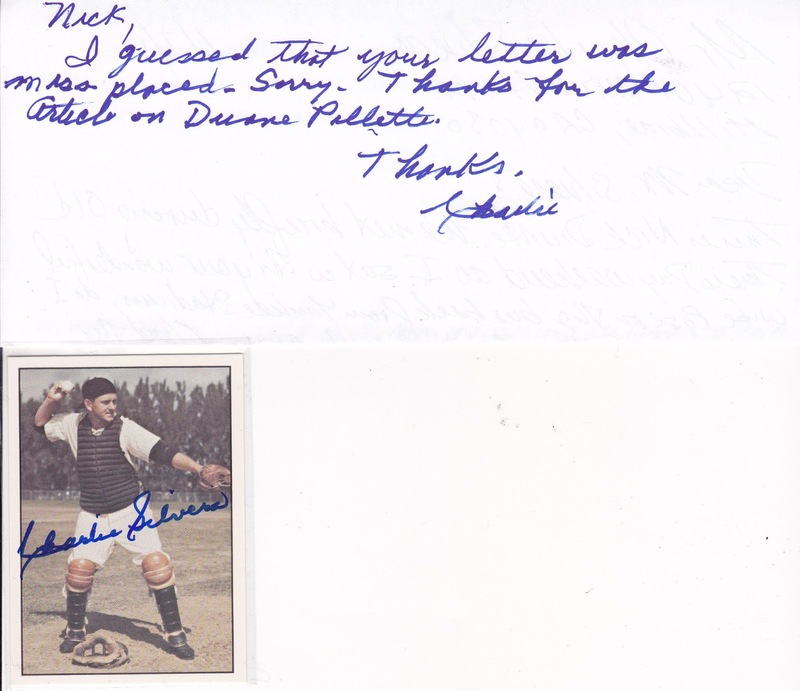 At the time of writing to him, I enclosed an article I wrote about the passing of his former teammate Duane Pillette. The 88-year-old Silvera won five straight World Series rings as a member of the Yankees from 1949-1953. Serving as a backup to Hall of Fame catcher Yogi Berra, he only had one season when he had more than 100 at-bats. His teammates nicknamed him the "Payroll Bandit," because they jokingly felt he was stealing money from the club. After his playing career finished, Silvera followed his good friend Billy Martin as a coach while he was with the Minnesota Twins and Texas Rangers. He remained involved in the game as a scout with the Chicago Cubs as recently as 2011. Silvera told some more inside Yankee stories about Berra, Martin and Joe DiMaggio to Ed Attanasio of This Great Game. Below is a 15-minute 2012 interview from the Inside China Basin podcast where Silvera discusses his role in the Yankee dynasty and the San Francisco pipeline that fed the New York Yankees from DiMaggio through the championship teams of the 1950's. Enjoyed the read and the video!